WMAP First-year Paper Figures, A. Kogut, et al. Geometry for Stokes Q and U parameters. 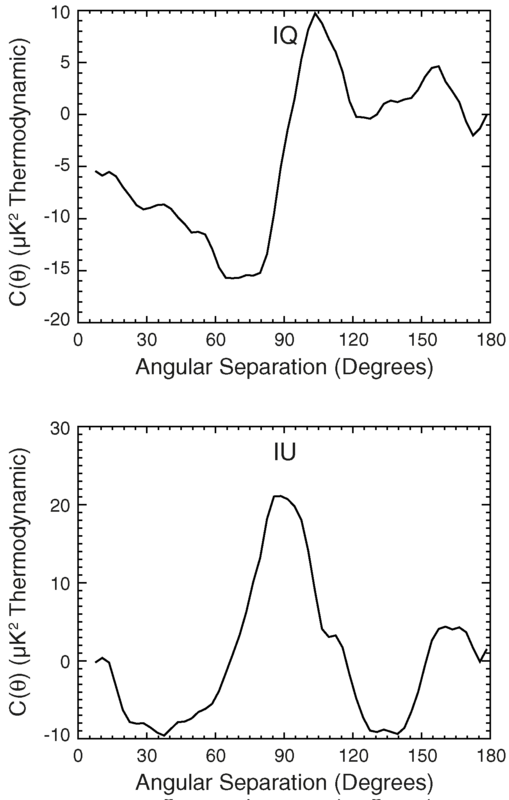 WMAP measures polarization by differencing two orthogonal polarization channels, then solving for Q and U as the spacecraft compound spin projects the OMT onto the sky at different angles γ relative to the Galactic meridians. 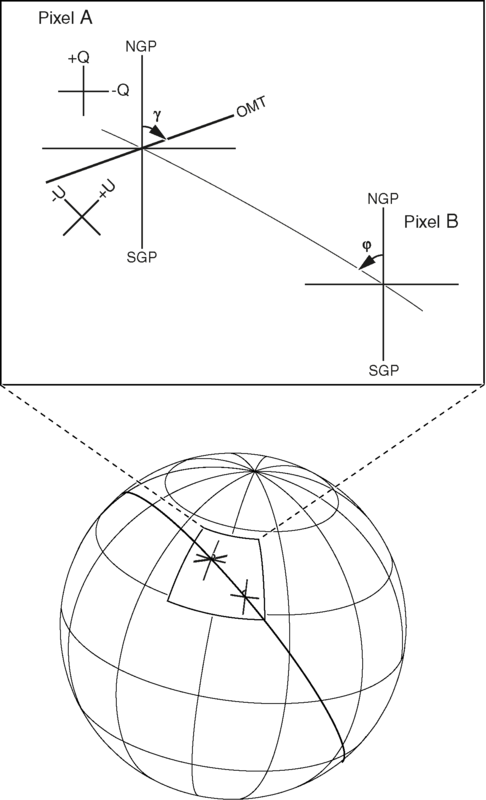 All analysis uses coordinate-independent quantities Q' and U' defined with respect to the great circle connecting a pair of pixels (see text). Temperature-polarization correlation function for WMAP co-added QVW data. The gray band shows the 68% confidence interval for similar co-added data taken from Monte Carlo simulations without polarization. The inset shows data for θ < 10°. The data are inconsistent with no temperature-polarization cross-correlations at more than 10 σ. Note that the data are not independent between angular bins. Angular templates for potential systematic errors caused by bandpass mismatch between the two radiometers in each DA. We fit this template to the correlation functions from each DA to detect or limit systematic errors related to bandpass mismatch in the main beam. The effect is significant only in the K and Ka bands, which have the brightest unpolarized foregrounds. 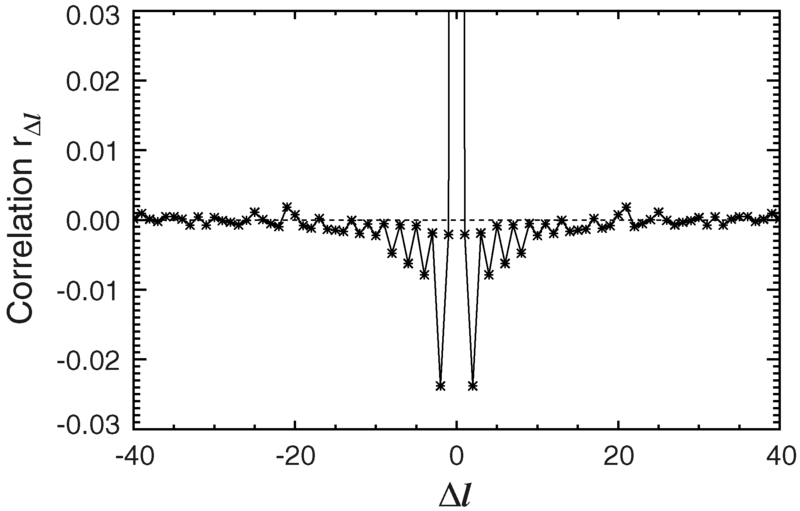 Fitted CMB(left) and foreground (right) components from a multifrequency decomposition of the measured two-point correlation functions. Top: IQ (TE) correlation. Bottom: IU (TB) correlation. The CMB component is shown in units of thermodynamic temperature, while the foreground is shown in antenna temperature evaluated at 41 GHz. Different colors show the effect of using different temperature maps in the cross-correlation or including different polarization frequency channels in the CMB-foreground decomposition. ‘‘ Co-add ’’ refers to a noise-weighted linear combination of the correlation functions computed for individual frequency channels. ‘‘ Fit ’’ refers to a two-component fit (eq. ) using the specified polarization frequency channels. 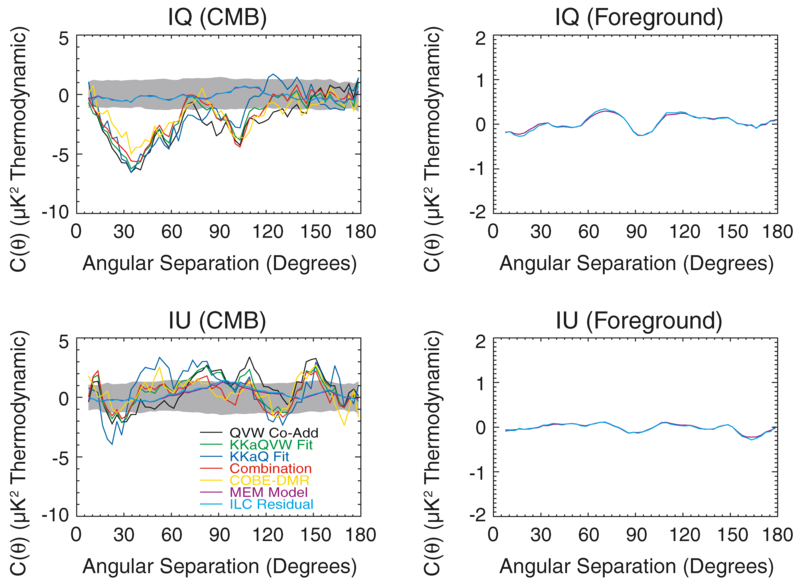 The gray band vshows the 68% confidence interval for the CMB component for the KKaQVW fit (which has the smallest statistical uncertainty) assuming CMB temperature anisotropy and instrument noise but no CMB polarization. ‘‘ Combination ’’ and ‘‘COBE DMR’’ replace the temperature map in eq. (6) with maps with reduced foreground emission: either the WMAP internal linear combination map or the COBE DMR map of the CMB temperature. ‘‘MEM Model ’’ and ‘‘ ILC Residual ’’ replace the temperature map in eq. (6) with maps dominated by foreground emission: either the WMAP maximum-entropy foreground model or the residual map produced by subtracting the internal linear combination map from the individual temperature maps at each frequency. The fitted CMB component is stable as different frequency channels and data sets are analyzed. Foreground emission is faint compared to the cosmic signal. Diagonal elements of the covariance matrix for the c lTE polarization cross-power spectrum. Points show the diagonal elements computed from 7500 Monte Carlo simulations. The solid line shows the analytical model (eq. ). Note we multiply Mll by [(l+1)/2π]2 to match the units in Figs. 7 and 8. Off-diagonal correlations rΔl in the covariance matrix for the c lTE polarization cross-power spectrum, computed from simulations. All values are normalized to rΔl = 1 at Δl = 0. The dotted line shows rΔl = 0 for comparison. The anticorrelation at Δl = 2 results from the spatial symmetry of the sky cut and noise coverage. Polarization cross-power spectra c lTE for the WMAP first-year data. Note that we plot [(l + 1)/2π]c lTE and not [l(l + 1)/2π]c lTE. This choice emphasizes the oscillatory nature of c lTE. For clarity, the dotted line shows cl = 0. The solid line shows the predicted signal based on the c lTTpower spectrum of temperature anisotropy; there are no free parameters. 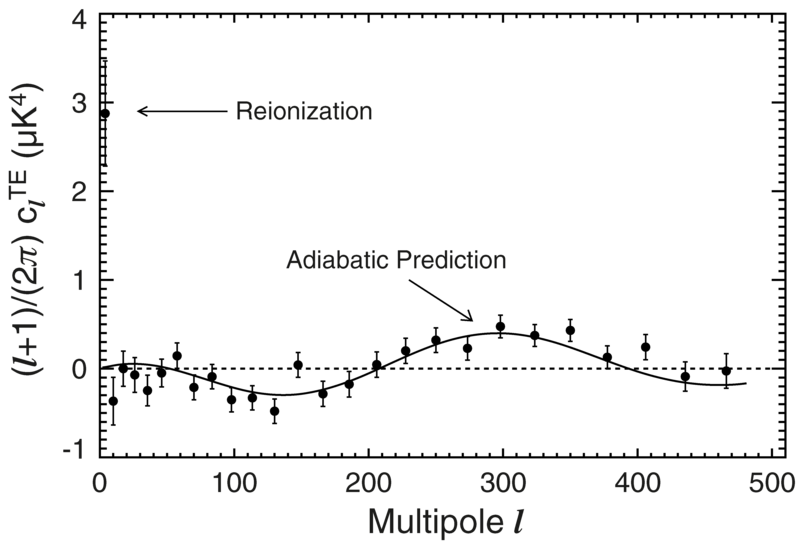 The TE correlation on degree angular scales (l > 20) is in excellent agreement with the signal expected from adiabatic CMB perturbations. The excess power at low l indicates significant reionization at large angular scales. 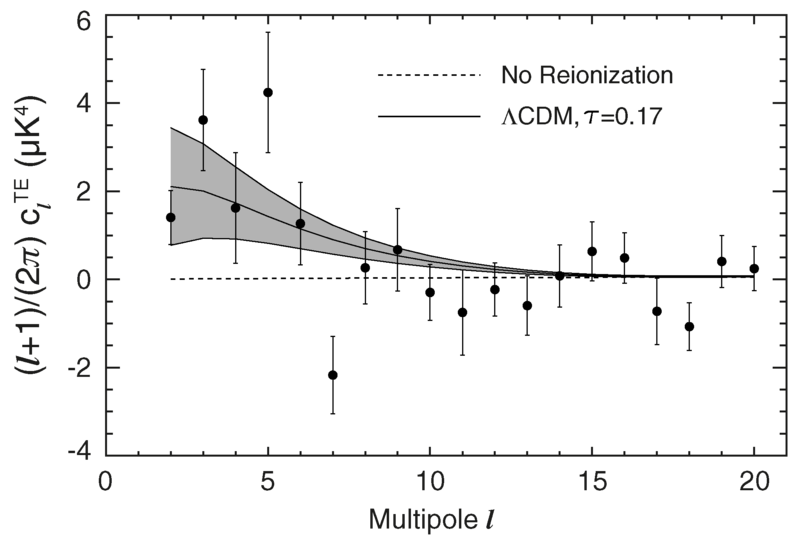 WMAP polarization cross-power spectra c lTE (filled circles) compared with ΛCDM models with and without reionization. 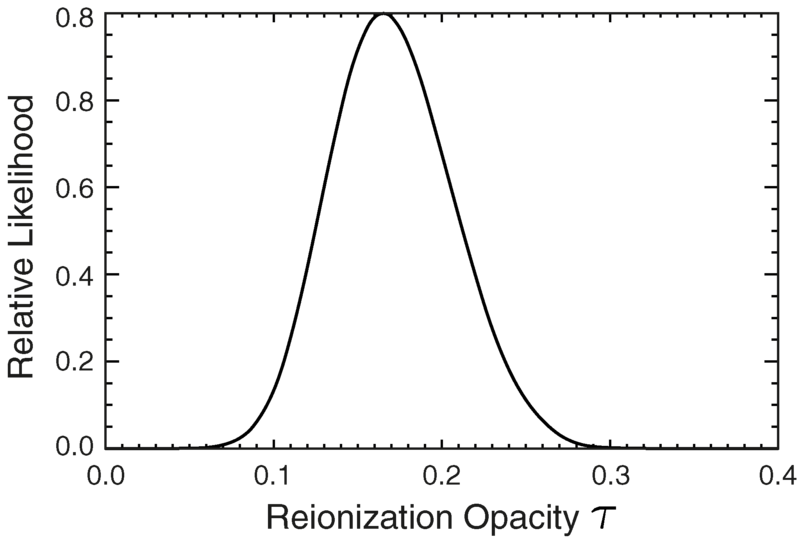 The rise in power for l < 10 is consistent with reionization optical depth τ = 0.17 ± 0.04. The error bars on WMAP data reflect measurement errors only; adjacent points are slightly anticorrelated. 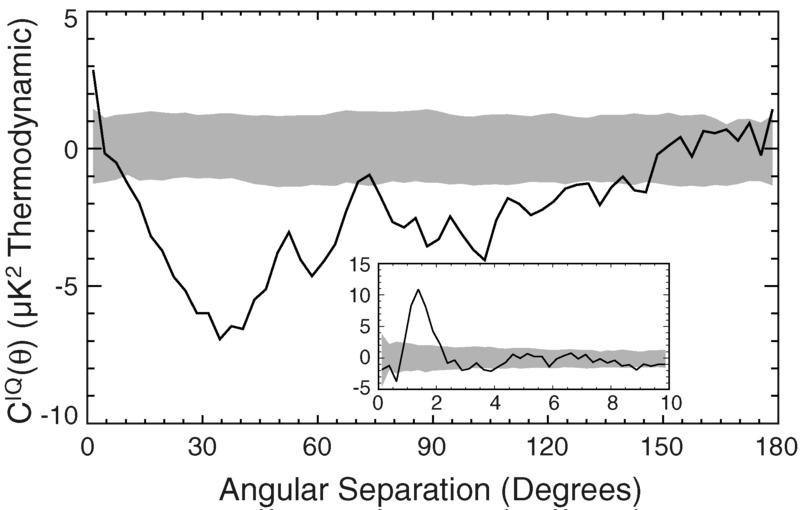 The gray band shows the 68% confidence interval from cosmic variance. The value at l = 7 is particularly sensitive to the foreground correction. 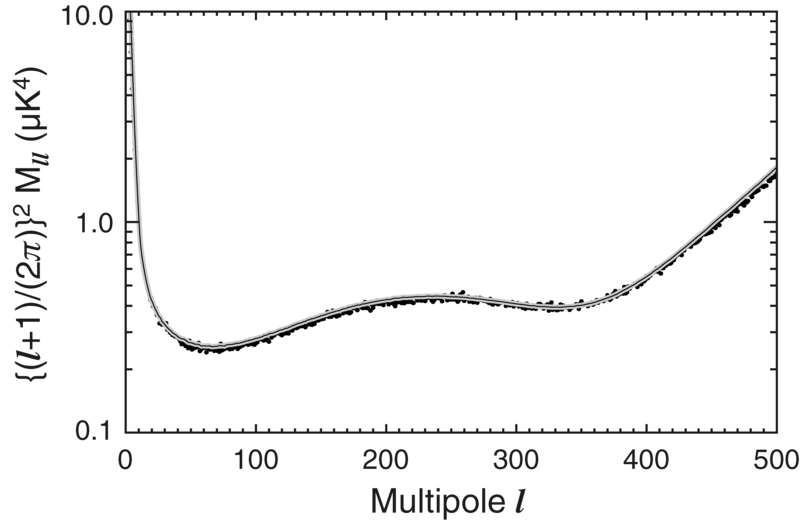 Likelihood function for optical depth τ for a ΛCDM cosmology, using all five WMAP frequency bands fitted to CMB plus foregrounds with foreground spectral index β = - 3.7. After including systematic and foreground uncertainties, the optical depth is consistent with a value τ = 0.17 with a 95% confidence range 0.09 ≤ τ ≤ 0.28.